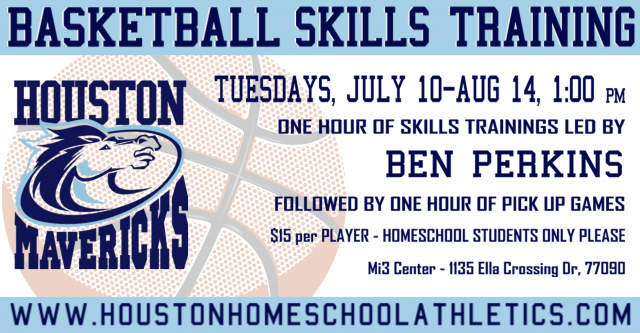 2018 BASKETBALL SKILLS TRAINING CONTINUES TUESDAY, JULY 10th at MI3 Center (1 PM) with Expert trainer BEN PERKINS. Coach Perkins welcomes home-schooled boys and girls of all ages (8-18) and skill levels to join him in the gym to work on their basketball skills. After the hour of skills training, stick around for 1 more hour of fun pickup games. $15 gets you two hours in the gym and a FUN afternoon with friends. Or $80 paid upfront on Paypal for all six sessions - send money to a friend at admin@houstonhomeschoolathletics.com. You do not have to commit to play with HHA to participate (but that would be awesome if you did ;-) ). COME JOIN US!